Age-related muscle loss is common among seniors. This natural consequence of aging, known as sarcopenia, can lead to diminished strength and reduced mobility. While the body may naturally lose muscle mass over time, there are steps seniors can take to counter the effects of sarcopenia and build muscle strength. Any form of strength training is good for seniors. Everyday activities like carrying the groceries, hauling the laundry up the stairs, and weeding the garden can build muscle mass. Seniors who are serious about bulking up should follow an exercise plan that optimizes the body’s ability to create new muscle tissue. Strength training enhances joint flexibility and muscle strength so older adults can stay healthy and independent. There are a variety of age-related health conditions that can make it more challenging for seniors to live independently. However, many of the challenges they face can be easier to manage if their families opt for professional elderly home care. Huntington families can rely on expertly trained caregivers to keep their loved ones safe and comfortable while aging in place. 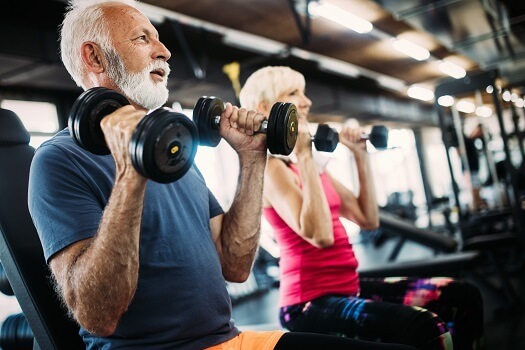 When seniors do strength training exercises at the appropriate intensity, the connections between nerves and muscle cells are strengthened, new muscle tissue is formed, and the body’s response to dietary protein is optimized. To achieve these benefits, seniors need to perform specific weight training exercises at a particular intensity. To achieve the right intensity, seniors need to choose the right weight. They’ll know they’ve found the right weight when doing a rep of 10 to 15 exercises is difficult but not impossible. Once they’ve determined their optimal resistance level, they should perform two to three sets of 10 to 15 exercises for each of the major muscle groups, including the arms, shoulders, chest, back, and legs. Age-related bone and muscle issues threaten seniors with loss of independence, but the golden years are not the time to give up on exercise. Many family caregivers assist their loved ones with daily physical activity, but some may have other responsibilities that prevent them from providing high-quality care. If you’re the primary family caregiver for a senior loved one living in Huntington, live-in care is available if your loved one’s health has become too difficult to manage without professional expertise. At Home Care Assistance, we take measures to help seniors prevent illness and injury by assisting with exercise and mobility, preparing nutritious meals, helping with bathing and other personal hygiene tasks, and much more. Muscle doesn’t grow during the weight lifting session. It grows during recovery periods. To maximize muscle growth, seniors should give their bodies plenty of time to recover—during and after the exercise session. While lifting weights, seniors should give their muscles time to recover between each set. They can take three minutes post-set to sit down, get a drink of water, or do a few stretching exercises. Seniors should schedule two or three rest days between each weight training workout, as this gives the muscles enough time to adapt, heal, and grow. Weight lifting can’t enhance muscle mass if the body doesn’t have enough protein. Protein is responsible for building and maintaining muscle, and seniors need high protein intake to increase muscle mass. They should eat protein at every meal and diversify their protein sources to ensure their diet includes a wide range of essential amino acids. Good protein options for seniors include eggs, chicken, fish, nuts, soy, and beans. Seniors can add whey protein to the diet, as this fast-acting form of protein optimizes muscle growth. Vitamin D is also important to healthy muscle development. Most seniors don’t get adequate amounts of vitamin D through diet or sun exposure, so they may want to add vitamin D supplements to their daily regimen. Caring for a loved one with preexisting muscle and bone issues can be overwhelming at times. Aging adults who require assistance with the tasks of daily living can benefit from reliable home care. Huntington, West Virginia, families trust Home Care Assistance to provide the high-quality care their elderly loved ones need and deserve. Our caregivers are trained to help seniors prevent and manage serious illnesses and encourage them to make healthier decisions as they age. To learn about our high-quality in-home care plans, give us a call at (304) 521-2909 today.